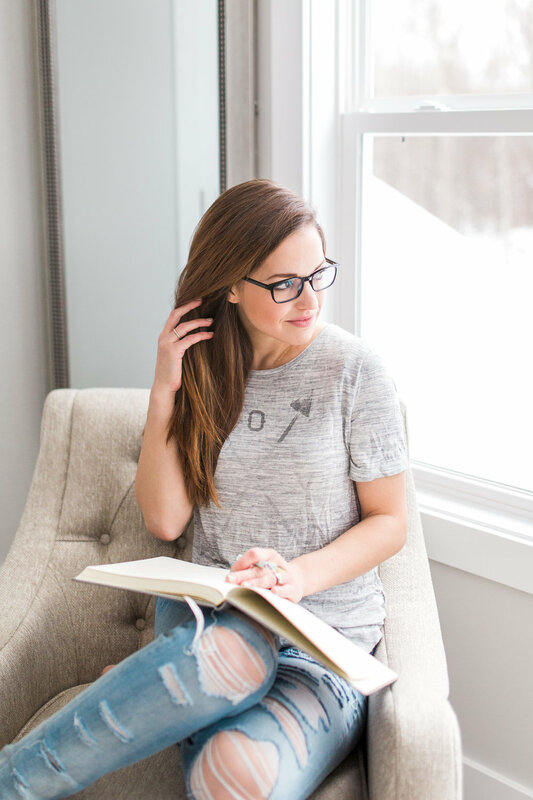 I kicked off 2018 with a fun, relaxed, lifestyle-branding session for my creative business! I've had this vision in mind for a while, and since my family and I have officially moved and settled into our new home, I just HAD to take advantage of the bright, clean space for some updated head shots! My original plan was to take these myself using a tripod and remote. I've done this on a few occasions, trying to "get in the frame" with my boys, but it is definitely quite challenging and I really wanted to nail these! Sooooo I called my sister last minute to help a girl out, and she happened to be avail! But Laurenda, your sister is not a photographer, how was she able to capture these for you? So, I had my sister sit or stand in the spot I was going to be. I metered for light and put in the manual settings for her. I then gave her a brief tutorial on back-button focus. THIS is key. If your assistant doesn't know how to focus properly, well the whole session is going to fail. It took her a moment, but after 5-10 minutes she was KILLING IT. Nearly every photo was tact sharp. If you guys aren't using back-button focus yet, head on over to THIS YouTube tutorial to see why you need it in your life! If my non-photographer sister can learn it in 5 minutes, YOU can too! We were shooting with my Canon 5D Mark IV and my Sigma Art 35mm lens. We did several short 3 minute sets so I could view what she was capturing and make adjustments to settings and give direction as necessary. I was very clear with her on how I wanted certain shots framed. I told her to stand back further to make sure she got my toes in, or move in closer putting the focus on my mug. I gave her a stool to stand on so she wasn't shooting up at me while I was sitting on the counter (because awkward angle!). Everything was very intentional, and I am so pleased with how well and quickly she took to it. So what's the importance of these images and what will I be using them for? Branding images are very important and can be used for a multitude or purposes. They will act as my new head shots, be used as stock images for my creative business, and used as marketing tools for advertising my photography and mentoring services. You'll start to see these images pop up on my website and across all my social media platforms. Having images that represent YOU and YOUR brand help connect YOU to YOUR ideal client. Well thank you for making it all the way to the end! I wanted to share some posing tips as I know this aspect can be intimidating and uncomfortable during a head shot session, especially if you're having a friend (or sister) assist you that's not experienced with giving direction! I've been modeling since 8 years old, so I have a bit of knowledge when it comes to this! The key is to look relaxed, and happy! As silly as this may sound, try laughing, a lot, at yourself and over your shoulder. I promise one will turn out and you'll LOVE it! If you don't know what to do with your hands, fold them in your lap, touch your hair (I do this a lot), or hold a prop that makes sense for the session! You can see I'm holding a coffee mug, my glasses, a laptop, cell phone, and pen/notepad in most of them. This fits my brand, helps tell a story, and also gives my hands something to do so they're not awkwardly hanging! Again, the main thing is that you look RELAXED! Play some dance music, jump around before the session to loosen up, or hey, pour yourself a glass of champagne! Have fun with it! !